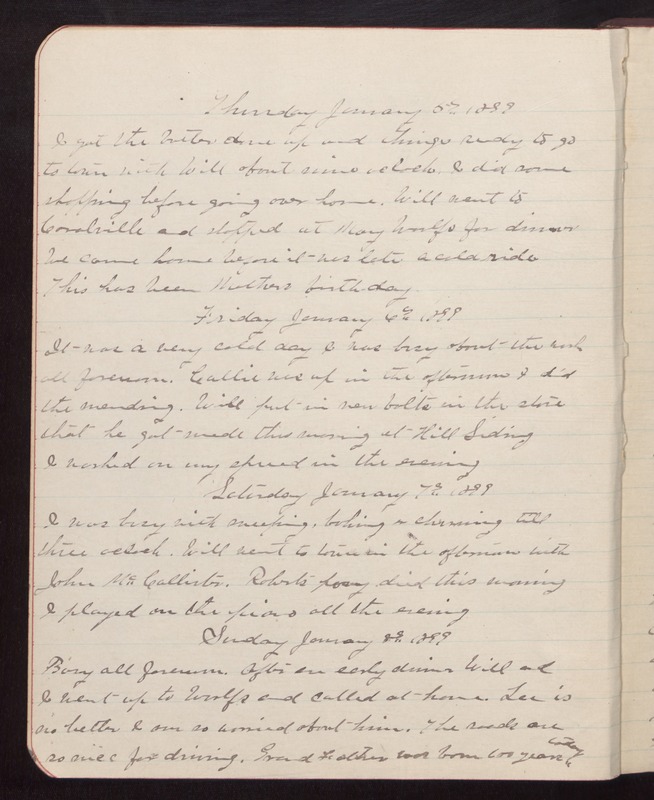 Thursday January 5th 1899 I got the butter done up and things ready to go to town with Will about nine oclock. I did some shopping before going over home. Will went to Coralville and stopped at Mary Woolfs for dinner We came home before it was late. a cold ride. This has been Mothers birth-day. Friday January 6th 1899 It was a very cold day I was busy about the work all forenoon. Callie was up in the afternoon I did the mending. Will put in new bolts in the stove that he got made this morning at Hill Siding I worked on my spread in the evening Saturday January 7th 1899 I was busy with sweeping, baking & churning till three oclock. Will went to town in the afternoon with John McCallister. Roberts pony died this morning I played on the piano all the evening Sunday January 8th 1899 Busy all forenoon. After an early dinner Will and I went up to Woolfs and called at home. Lee is no better I am so worried about him. The roads are so nice for driving. Grand Father was born 100 years today.